By BoltBait, August 26, 2008 in Plugins - Publishing ONLY! What are selection tools? How are they different from other effects? Good questions! I have grouped this set of effects under the Effects > Selection menu because of how they work. Most effects don't really care about the shape of the selection, they just do their effect. These tools, on the other hand, apply their effect based on the shape of the "marching ants" selection. The very first effect I ever wanted to write was a feather effect that would feather along the selection. I couldn't really figure out a good way to do it so I wrote another feather effect that used transparency to determine the edges of objects. While good, it was never really the effect I wanted to write--it was just a "hack". Well, I finally figured out a good way to do it! To use: Create an irregular selection and run Effects > Selection > Feather Selection. It feathers the selection along the trail of marching ants. As you can guess, this will be REALLY useful for making photochops! And, I think, MUCH less confusing to use compared to my current feather plugin. To use: Create an irregular selection and run Effects > Selection > Outline Selection. It outlines the selection along the trail of marching ants using the selected color. To use: Create an irregular selection and run Effects > Selection > Bevel Selection. It creates a 3D... like... um... "puddle" (I guess)... out of the selection along the trail of marching ants. You'll just have to play with this one to see what I mean. It makes some great looking text! To use, select the area where you want to render the shadow. Looks great with text or other irregular selections. All 4 of these effects are grouped together in SelectionTools.dll which you can find in my plugin pack. If you need help installing plugins, I recommend reading this page: How to install Paint.NET plugins. *Some of the bug fixes in Paint.NET 3.36 were a result of the development of this effect. Thanks, Rick! With the inclusion of these effects, I think it may be a good time to have a way to expand a selection by a specific percentage, otherwise, this feather now works pretty much like the one in PS, but easier. It really depends. They are both different effects. Personally, I use both depending on the situation. oh sweet mercy that bevel plugin is simply awesome! I would keep both too. But it seems I had some problems with feather after using the bevel selection, am I doing something wrong? Editing: Now it works perfectly, Thanks Ash! Update the rest of BB's plugins. Boltbait could your 'Flip' effects please be moved to this menu? Thanks for all the time and effort you put into Paint.net. 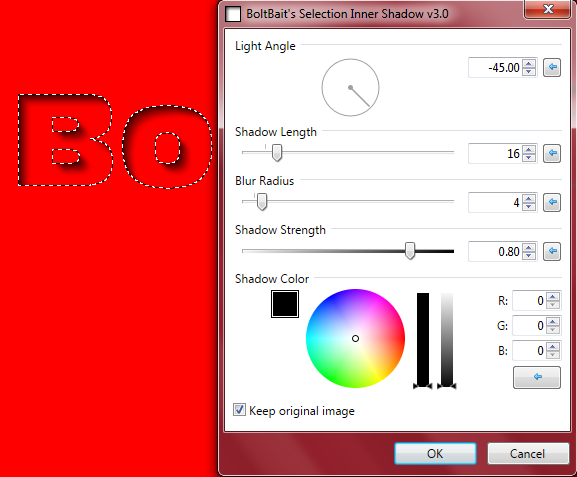 BoltBait, I'm lovin' the Bevel Selection plugin so far, as it's making my life easier in some projects I'm doing. Would it be possible to have an angle chooser, to simulate a light source from another direction? Would it be possible to add a transparency to the shadow/highlight colors for the start of the color? For the transparency issue, I simulated it by doing my selection on one layer and running the bevel on a separate layer and then adjusting the opacity of the new layer, or blend modes. The angle chooser I think would be tougher to come up with as it would have to do the bevel shadow and highlight in different areas depending on the angle chosen. second these requests ... if possible...know you have your hands full on the codelab thing but would love to see these in future releases of this plugin ..... along with the ability to type in the exact hex colors for the higlights and shadows. @Curmudgeon the work around I've been using for your second item is to rotate the layer with right click run plugin and then re rotate back again. and I use transparency plugin for the opacity that way it doesn't wonky up when you merge layers. That's about the best way to adjust the amount of the effect. I'm glad you figured it out. that's why it was only tossed out as an idea. no worries...I was hoping that something like the Illuminate plugin or the bevel selection could accomplish it. Hex values? or will this mess up your UI box. its not necessary but I use them almost all the time when I'm working on my pictures. (Although I do keep a cheat sheet next to me with the RGB values) and can get by very well with using those if not possible. once again I can not express how great this plug in is. It makes my glass work and water work almost mallable to what ever shape I'm going for. simply super. thanks mega from the picture making bunch! Hex value input would be a job for Rick. I am simply using the IndirectUI color control. If he was to enhance it to allow for hex input, my effect would automatically use it. Ok that explains it. thanks as I said its not a must I've my work arounds that work just fine. Could you release the source code? I would like to see how you implemented this. Just to inform you, this plugin was written by BoltBait.